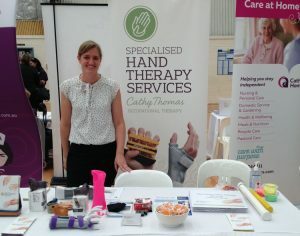 Early in October Specialised Hand Therapy staff member Nicole Myrland from our Rockingham clinic had the pleasure of attending the 8th Annual Rockingham Seniors and Carers expo at the Mike Barnett Sports Complex. We were one of the more than 140 stalls providing valuable information to the community on the services available for Seniors and Carers in the City of Rockingham, where Seniors make up about 16% of the City’s population. The community seemed very happy we were represented at the Expo as Nicole spoke with hundreds of attendees about common hand conditions and their management over the course of the four hour event. The most common questions related to arthritis, and the Seniors were thrilled to learn that there are many different treatment options for arthritis particularly for arthritis of the thumb (such as pain free strengthening of the dynamic stabilisers of the 1st CMC joint and joint protection principles). Another common question related to nerve compressions such as Carpal Tunnel Syndrome. Many of the Seniors were unaware of conservative management options for these common conditions. Specialised Hand Therapy Services were very pleased to be able to talk with Seniors and Carers about our services at the event and look forward to our continued involvement in the future.